Side by side installation of these inverters is possible as long as the surrounding air temperature does not exceed 40°C. 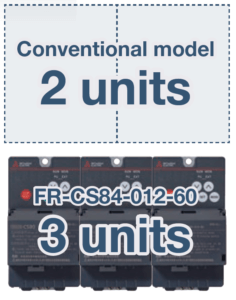 Three FR-CS84-012-60 inverters can be installed in the same space normally required for two conventional models which ultimately means space saving. A DIN rail installation attachment (FR-UDA ) option can be used but this is excluded for inverters FR-CS84-120 to 295. The applicable motor capacity is the maximum allowable capacity of the motor with respect to a Mitsubishi Electric 4-pole standard motor. 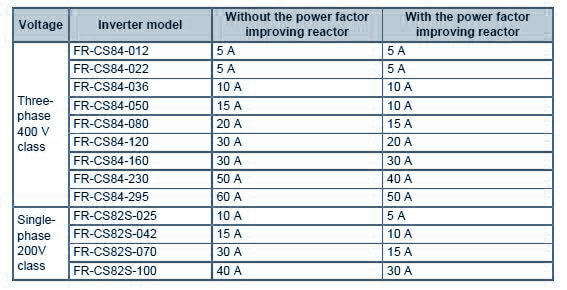 This is a matrix showing the rated current of the molded case circuit breaker (MCCB) or earth leakage circuit breaker (ELB) (NF or NV type) according to the selected inverter and rating. A free trial version of software FR Configurator2 can be downloaded at Mitsubishi Electric FA Global website. This software contains start-up functions which allow for a shorter startup time with easy setup. 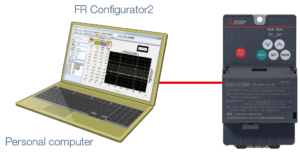 The FR configurator2 software has the common design and operability of MELSOFT Mitsubishi Electric FA products. There is a reduction in the wiring check time since the wiring can be checked by simply lifting the control terminal cover, which makes maintenance work easier. The control circuit terminals are spring clamp terminals which allow for easy wiring to the control circuit. 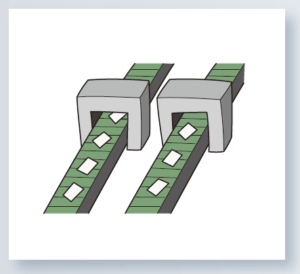 The main circuit terminals are screw terminals. Easy wiring is completed by inserting the dedicated blade terminal of each cable. Without using the blade terminal, the loose wires can also be connected using a flathead screwdriver. The spring clamp terminals provide high reliability since the internal terminal contacts are spring-type. Therefore, these wires can be protected against loosening or contact faults due to vibrations during operation on a bogie or during transport. It is maintenance free because no additional screw tightening is required. 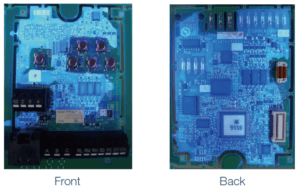 A specialised coating that conforms to IEC 60721-3-3 3C2/3S2 standards, covers the circuit board to protect the board in hazardous environments and for improved environmental resistance. This inverter supports a variety of functions that can be used in various applications. The motor decelerates to a stop without coasting when a power failure occurs or undervoltage. Slack in the thread can be controlled even if there is a power failure. 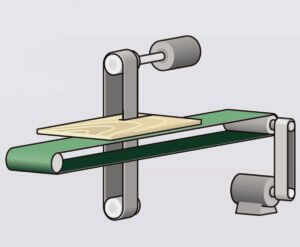 The traverse function, used for the traverse axis of the spinning machine, prevents uneven winding or collapsing. Even in the event of an instantaneous power failure, motor operation continues without coasting and production is maintained. 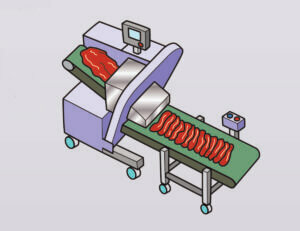 Conveyor belts can be controlled individually by using multiple inverters. Automatic operation is possible by collectively managing multiple inverters. The deceleration time can be reduced without using a brake resistor. The tact time can be reduced to a transfer line or equivalent. An S-pattern is maintained from the present frequency to the target frequency; therefore it is possible to reduce shock during acceleration/deceleration and prevent load shifts. The flow rate and air volume are controlled by an inverter. 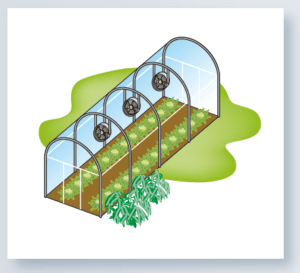 It is possible to regulate the flow rate and the air volume so that they stay at a preset level. This control enables the motor efficiency to achieve its optimum. More energy saving is possible in applications with variable load torque characteristic such as a fan and a pump. 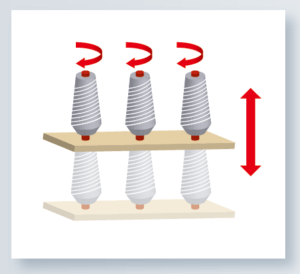 The optimal V/F pattern matching the torque characteristics of the facility can be set. Even in the event of an instantaneous power failure, motor operation continues without coasting and the fountain’s operations are undisturbed. 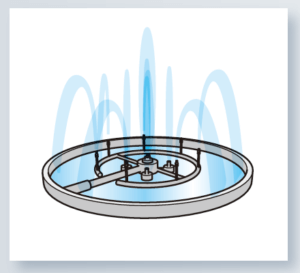 A variety of fountain displays are possible by connecting a brake unit which allows high starting torque and improved braking efficiency during deceleration under general-purpose magnetic flux vector control. Operation speeds can be preset via parameters. Motor speed to meet the height requirements of the fountain can be set and easily changed. The motor decelerates to a stop without coasting when a power failure occurs or undervoltage. This function is useful for stopping the motor during a power failure to prevent danger. Operation speeds can be pre-set via parameters. Operation speed suitable for the ingredients being used can be set and easily changed. Operation continues and the overcurrent alarm is not activated even if there is a sudden change in load during the cutting of food. Depending on the type of ingredients, with the right amount of low-speed torque, it is possible to regulate a suitable speed for food production. The motor decelerates to a stop without coasting when a power failure occurs or undervoltage a predefined value. This function is useful for stopping the motor during a power failure to prevent danger.